By an interesting coincidence, I spent two successive days last week attending events related to manufacturing competitiveness. 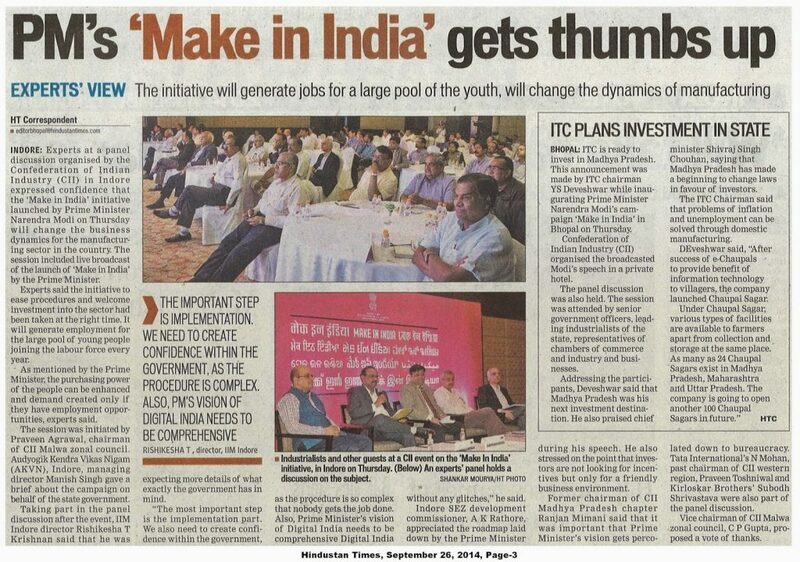 The first was a panel discussion organised by CII Malwa Zone to coincide with the launch of the Prime Minister of India’s new “Make for India” campaign, and the second was a day-long seminar designed by the Institute for Competitiveness (IfC) that culminated in the award of the Porter Prize. I am a strong believer in getting the basics right if you want manufacturing to take off. Some of these basics are captured in the World Bank’s “Ease of Doing Business” survey that covers permissions and sanctions required to get going and run an enterprise. This is an index on which we don’t do well (current rank in the 130s). The basics I am referring to here are availability of land/factory premises, electricity, water, key raw materials and labour, of a minimum quality at a reasonable cost. 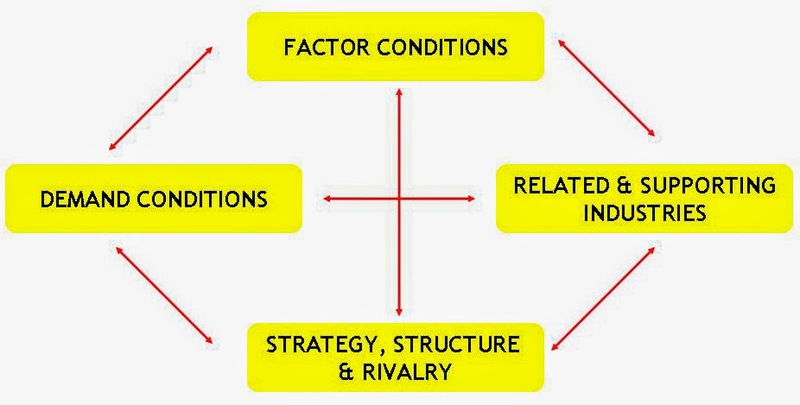 Michael Porter underlined the importance of these factor conditions in his “diamond” framework for the Competitive Advantage of Nations. Competitive manufacturing requires timely receipt of inputs, and for the goods produced to reach dealers and customers on time in good condition. While IT-based services can work in islands because the output is beamed to customers through satellite links, manufacturing is a logistics-based activity that depends on end-to-end efficiency. Individual companies are nodes in international production networks and can’t afford to be inefficient in either in-bound or out-bound logistics. But, according to a recent article I read by Lal and Vishwanath, the freight rates between the core and periphery of an Indian city can be as many as 5 times what they are in the US! Traffic congestion and poor roads make progress within cities slow – a recent report suggested that the average vehicle speed in Bangalore is 9 kmph – leading to high fuel consumption, limited trips per day, and a longer time to recover the capital cost of a transport vehicle. Politicians and bureaucrats tend to take a sanguine view of the importance of many of these basics. I have heard them say things like “if the power supply is not reliable, why don’t you use a generator?” without understanding that installing your own generator pushes up capital costs, and the cost of generated power (particularly in small scale) is multiple times the cost of power generated and distributed through a well-functioning grid. Many manufacturing units work on thin margins and can’t afford these additional costs. It was therefore refreshing to hear the Prime Minister agree in his “Make for India” speech that it is the government’s responsibility to provide the core infrastructure required by the manufacturing enterprise. He also observed that companies choose a location not based on the incentives available but based on the basic facilities provided! 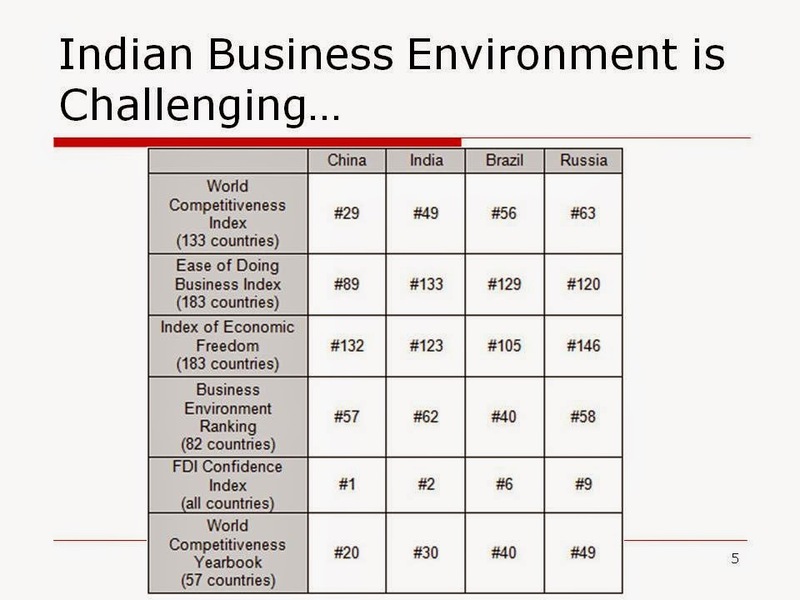 Kevin Stolarick of the India Institute for Competitiveness, University of Toronto, put this well when he emphasised during the IfC that we should focus on competitiveness at the local level. He pointed out that national competitiveness depends on local competitiveness, and hence our priority should be to make Delhi, Ahmedabad or Mumbai competitive rather than looking at BRICS. In his keynote at the Porter Prize event in the IfC, Michael Porter underlined this when he observed that regions are the most important economic unit for competitiveness. He went one step further by pointing out that efficiently functioning clusters provide the “lift-off” factor that takes one region ahead of another. Indian companies have shown that they are capable of optimising efficiency of the factors directly under their control. During his talk at the IfC, Shashi Ruia of the Essar group pointed out that in their world-class refineries in Jamnagar, companies like Reliance and Essar are able to achieve globally efficient throughput. Though the technologies used in these refineries have been sourced from global vendors like Dupont, 90% of the fabrication and detailed engineering has been done by Indians in India, so we clearly have the ability to be competitive. There are sharply polarised views on inspections and ensuring regulatory compliance. While the Prime Minister set the tone for this in his “Make for India” talk by calling for greater trust in each other and recalling his government’s decision to do away with attestation of document copies by gazetted officers and instead move to self-certification, I found it interesting that one of the industry participants in an IfC panel believed that government inspection is required. His only wish was to reduce the number of regulatory agencies (“why can’t the boiler inspector and the factory inspector be the same?”). The issue of skills and training came up in many of the panels of the IfC. The facts are well known – India needs to generate 10-15 million jobs every year if it wants to ensure that the demographic dividend does not turn into a demographic disaster. These jobs can’t be generated by the service sector alone and we need a robust manufacturing sector that can provide such opportunities. But, we currently don’t equip our youth with the right skills to make productive contributions to manufacturing. Skill development was initiated by the previous government, and has now been upgraded into a separate department by the new government. So far, the skill development mission has succeeded in skilling about 400,000 people a year. Most of this is done in the PPP mode – see my earlier post on a successful initiative launched by PARFI. But, skilling is not only a supply side issue. Companies need to be willing to recruit skilled manpower at higher cost rather than unskilled labour. Many companies have been unwilling to do so in the past. We need to publicise the example of companies such as Bharat Forge that became globally competitive by adopting better manufacturing technology (in this case, greater automation) and shifting to a better educated and skilled workforce. However, effective skilling is not only about training methods, certification and scale. Social issues have also to be addressed if we want our skilling efforts to deliver results. In many parts of the country, absenteeism is a serious issue with workers missing out on work as much as 20% of the time due to poor health, family emergencies and social and religious commitments. And, it’s not clear that our youth will opt for vocational courses even if they are available and offer a path to a good job. The aspiration for a white collar job is high and has been reinforced by the success of the software and BPO industries. Kevin Stolarick put this well when he called the success of services a curse. Another issue relevant to the skills and employment debate is the need to get the capital – technology – labour mix right according to the requirement of the industry. Speakers at the IfC pointed out that China seems to have got this right by investing in the most labour-intensive industries (like making toys) at the village level. Earlier governments did realise the importance of manufacturing but never put their muscle behind it. I am glad that for the first time we have a government that is starting a nationwide campaign to promote manufacturing, and that this campaign is being driven from the top. But, we shouldn’t under-estimate the complexity of this challenge, and we therefore need a detailed blueprint if we are to succeed.